Navigation hierarchies and key filters with slide library : Code Fix. According to the popularity of the blog post : “Navigation hierarchies and key filters with slide library“, I decided to share a code that fix Slide Library view. This code snippet replace existing ListViewWebPart on the slide library view to the new XsltListViewWebPart and configure it in a proper way. If you execute this code on the all slide library views then you will get a full-functional slide library with fixed navigation and filters. P.S. Great thanks to the Dmitry Chirun for this fix. This is task appeared when I needed to migrate SharePoint site collection from one farm to another. First time we had used SharePoint 2010 back up mechanism, but this approach hard enough. We had a lot of errors during restore: broken connector, errors with content hub, access problems and so on. Every such restoration has brought new errors. We could not document restore process well enough.But then we have found new way of migration. Restore database from this backup into new farm to database of another Managed Metadata Service. Keep in the mind, that you can not create two Managed Metadata Services in the one farm this way, because the Guid of the service store directly in the database. After such restore you can work with just one service. Some month ago I encountered with a problem of using Navigation Hierarchies and Key Filters with Slides Library. I was added the Managed Matadata field to my slides library and turned on the Navigation Hierarchies and Key Filters on the Library Settings page and nothing happened. But the same sequence of actions works with Document Library. We have found the solution of this problem and I will try share it to you. 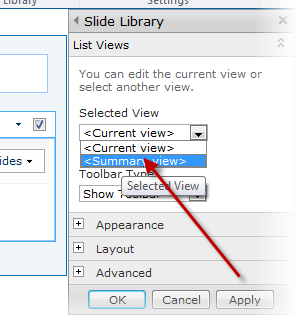 Let’s open default view page of the slide library in the SharePoint Designed 2010. And what we see? Default view page which was generated by default slide library template contains old ListViewWebPart. We need to replace this web part on the new XsltListViewWebPart . I propose you the way to do it without using any custom utils except SharePoint web UI. 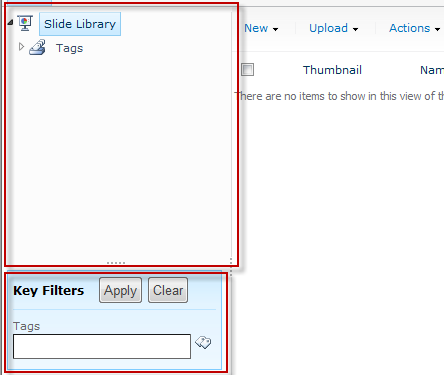 Open the Slide Library and click Site Actions\Edit Page. Choose a web part and click Edit Web Part. Change the Selected View property from <Current view> to <Summary view>. And click OK but do not click Apply. Click OK in the popup window. Click the name of your library into the left navigation panel. Now you can open the view in the SharePoint Designer 2010 and see that web part was changed. Navigation Hierarchies and Key Filters also working.